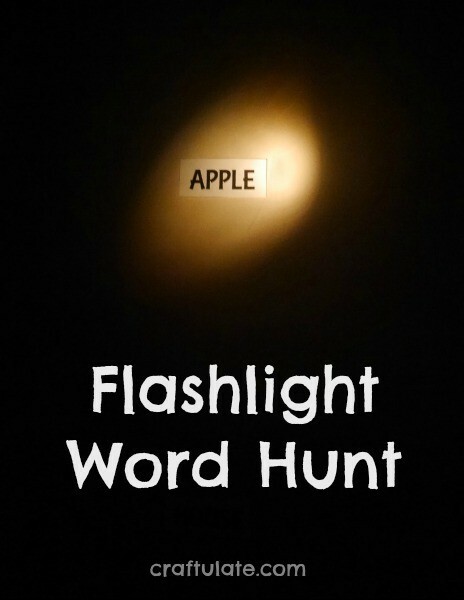 This flashlight word hunt is a fun educational activity to do in the dark! Since we moved house, we’ve been discovering the joys of our first basement. And more recently, my son has been discovering the joys of how DARK it can get down there, and the fun of searching around with his Thomas the Train flashlight! I decided to develop his new fave activity by turning it into a word game. I printed out ten words that I *thought* he could probably read, but I wasn’t sure when out of context. I stuck them up on the wall in a corner of the basement. When he spotted them, we turned the lights off and I gave him the flashlight. “Can you find the word… ‘bed’?” and so on. He did pretty well on all the words apart from ‘train’, and he worked that out once we identified the starting letter. He then decided it was my turn! He got his toy camera and gave me his flashlight. He then called out words for me to find, which really proved to me that he could read the words! The photos he took are basic but he did well! The next day he played again, but then he asked for new words. So he came with me to my computer and suggested words for round two. This included some of his favourite TV characters and items that he’d eaten for lunch! Some trickier words here but again he did well finding the words. And then he wanted me to have a turn again! And the day after that? He requested more words. The day after? More words. Happy Mama!